Ballrom ... it could be a place you had a big wedding... Just a big meeting room, very nice for an arena with a crowd of 5,000. The stage was very very low, I would say club show heigth like 5 feet max. I.e. somethink like 1,5 meters. I am tall and I looked down to the floor. And I had a great seat, believe me. I did not even have to self-upgrade on this show, but I had to take care of my position. It was tough. Very tough. It seemed like EVERYBODY wanted to be in row one, hundreds, and I chose the right time, the right place, and the right "pal" next to me. Well I was dead center next to my pal. 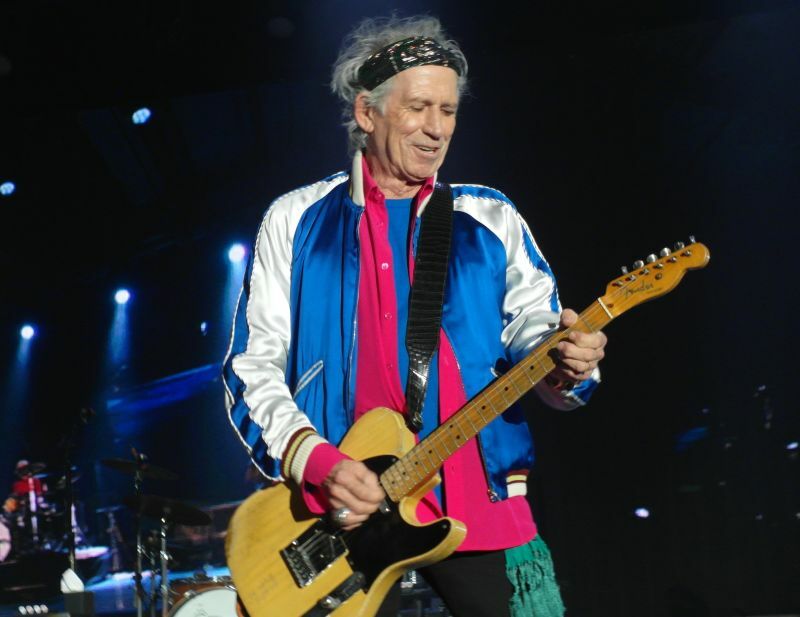 He was very nice, an expat, he had seen the Stones 5 times over the past 40 years, including the 70's, 80's, two times in Singapore last time 2003, and now this night. Security cleared out the entire Ronnie side front in a massive operation that took a dozen security people (or two) and half an hour from 8pm onwards. The security people on my side (Mick side and also Keith side) had an extended meeting with the guys behind me. I checked the time and I saw the clock was ticking closer to 8:30pm. Then saved by the bell at 8:31pm they were on. We had another mysterious security raid like half an hour into the show. I can't believe they tried to move out a mountain of fans who enjoyed the show, it was long time into I don't know, may be TD or Wild Horses. 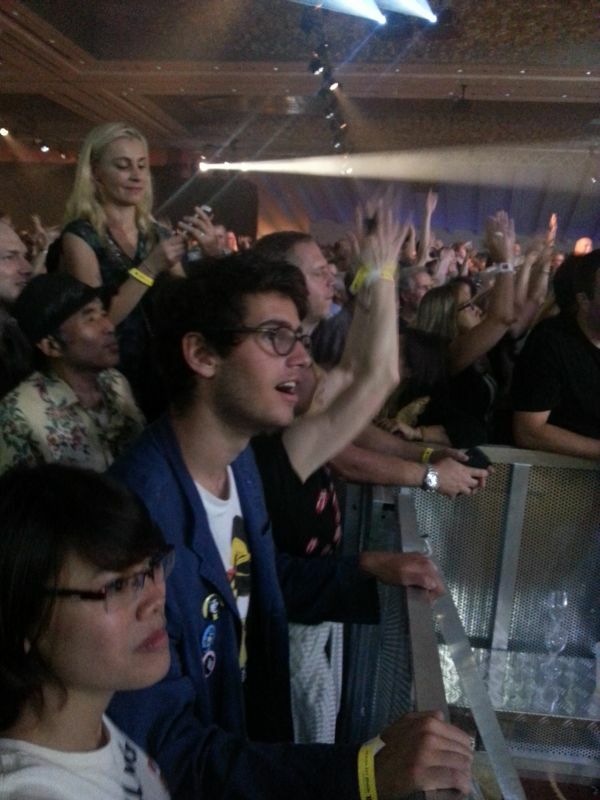 But in the end they (security) realized this was a rock'n'roll show, and we could concentrate on the stage. 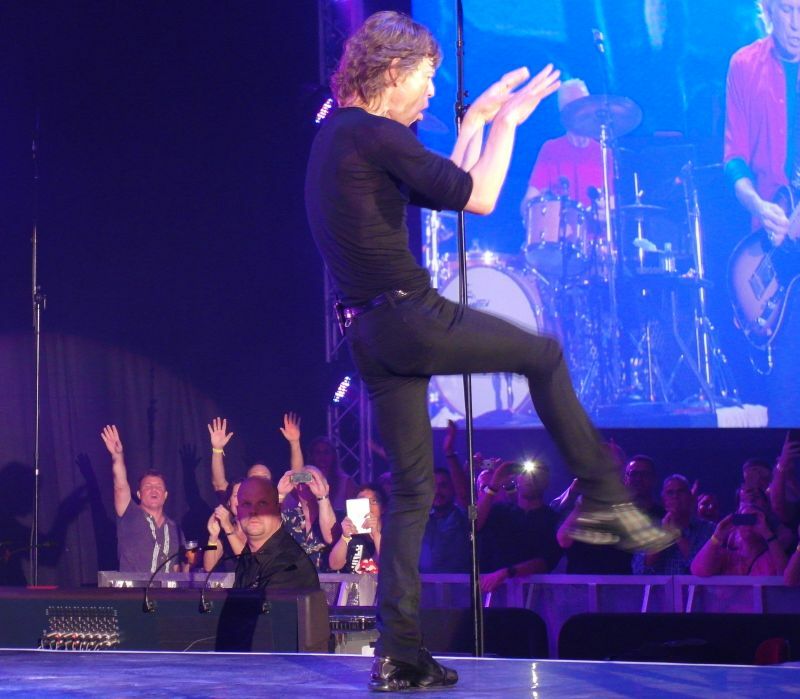 Well to be honest I am very good at masking out all sorts of outside disturbance when the Stones are on stage. The Latvija scarf they picked up in Shanghai was nicely placed on top of Keith's monitor at the beginning of Doom & Gloom by Pierre. They did really take good care of it. One time it slided down a bit, as the bass drums beat kept it vibrating, then they put it back in place on the monitor. Nice. Mick presented Chuck Leavell saying: "Without him there would be no band". Sympathy For The Devil strong as always. Keith evil eyes, evil guitar playing, at the end his pick is flying and there it is in my hands. Tongue side of the pick worn out the way he played Sympathy I guess. Other side KEITH RICHARDS. Nice catch. I placed it on my set list and made a souvenir picture so that I can see it when I return to these pages. Mick kept security busy as he went down and did high five with the fans both sides, first Ronnie side during Paint It Black. After that they knew he would do the other side but not when. Then he came down on Satisfaction. Everybody went nuts of course. Great show but Shanghai was by far the best so far, high standards on this tour. WAS IT SOLD OUT? It was so sold out it could make a grown man cry! It sold out in an instant. This was a 5,000 capacity ballrom. Slightly bigger than Brixton Academy (3,800 people). The could have sold out 2-3 shows at the very same venue. They added an outdoor screen with a live telecast of the show. Better than nothing. The Stones even went outside for real for a minute to say hello on the stage outside, so this was a special event. While they performed this totally sold out show in Singapore they sold out festival tickets in Europe. I don't believe in all these crazy ideas about tickets not selling or sales being slow. They sell out faster than you have time to hit the "BUY NOW" button, and please do not waste any time. If they play anywhere near you, move mountains, sell your bike or car, go see them. You will not regret! Additional note written three weeks after the show: Sadly life took a change nobody could expect soon after this show. The reviews and pictures never appeared here. Until now. 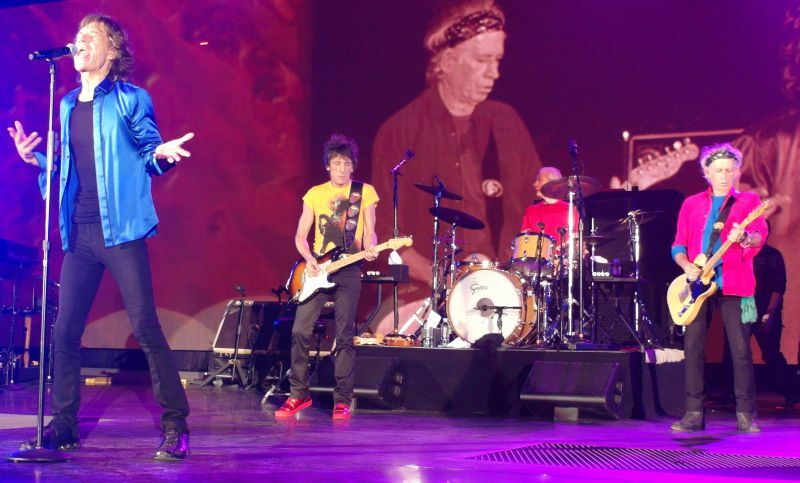 The Singapore show will have a special place in our hearts and in our Stones history. Looking back I wish I could turn back the clock and freeze the time, go back to Singapore and stay there, but life must go on. I'd had to get up at 2am in the UK to make sure that I got tickets for this gig, my first in Asia, when they went on sale. No idea of the venue size/style, or whether the crowd would be excited or formal. I don't have quite the negative view of Singapore as others - yes it a bit steralised, but it all works brilliantly, is safe and healthy, and the people know how to party. We had seen the Stones tweet about only 5,500 attending so expectations were raised; and the outside simulcast attracted lots of people. Some bars outside added to the atmosphere and a couple of decent bands I heard - all covers but sound quality great and a superb location. We ate at a Pizza place which was playing some great music, a little quietly, including Melody, Monkey Man and Slave. Many of the attendees I saw looked and sounded like corporate hospitality types. I suspect as much as 10-20% of the audience, and less then 5% serious (anorak) fans. I'm guessing that a high level of attendance from the sponsors (and their clients) made this gig economically viable for the band. Otherwise I can't get the numbers to add-up even to break even at this size venue. We wandered into the Ballroom one hour before the supposed start, but the pretty useless security people weren't letting anyone in - a slightly irritable queue built up. Then suddenly it was a cursory ticket check (machine didn't work, so they gave up on that), even more vague bag check, and we discovered a fantastic venue. Wider than deep (so the runway reached close to the back), low ceiling, everything very close. This was like a large theatre, but with no balcony - just some raised seats towards the back. The audience entered slowly, so a "late" start, but I didn't realise the band had made a brief foray outside to meet the crowd - what a fantastic gesture just when they were in pre-gig warm-up/focus mode. Plenty of big screens inside but you really did not need them from where we were. 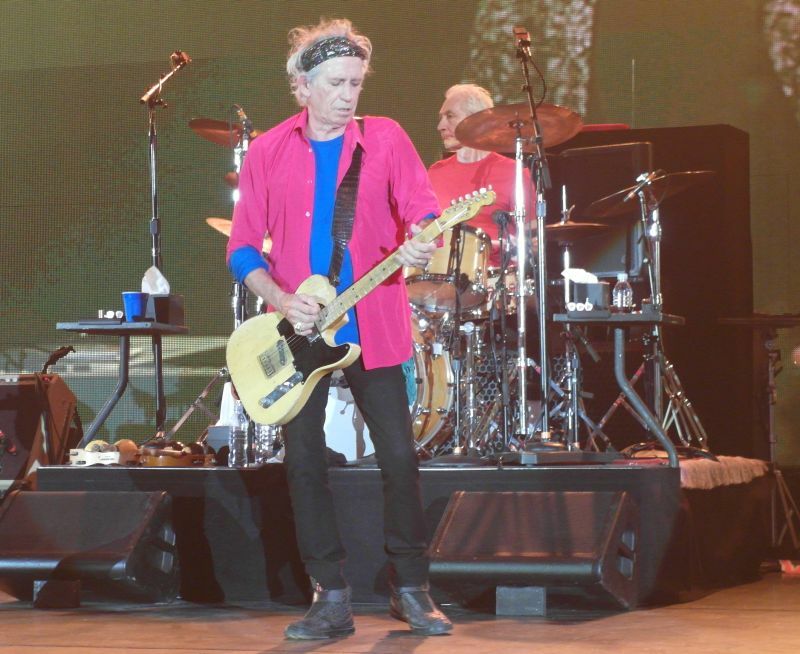 We were on Keith's side, about 45 degrees off-centre, row S. Best I could get when booking 2 minutes after tickets went on sale!. Then on they come - JJF, and people standing on seats close to the front obscuring the view (and not just because some of the locals are a little vertically challenged and needed extra height to see). So it was time to really test the security and I headed for the front - got to within 5 people of front barrier in a small group and we stayed there all gig. Apparently everyone behind us stood on their chairs for the whole gig. I had a much better position than most of the "standing tickets" which made me feel a little guilty for the real fans who bought them for more money than I paid, but much better about the "VIP" ticket holders, which made me feel good. Interesting little things you think about. The VIP seats have cloth covers like you find at a wedding reception - very rock'n'roll. No attempt by security to move us - I'm guessing this happened at other places as well. Anyone I could have lifted up most of the security staff - they weren't hulks by any means. For the first couple of songs it was the clear the band were really enjoying themselves; smallish venue, lots of very close audience feedback; not remote as a stadium or even an arena must feel - I think they love the "pit" as much as we do. 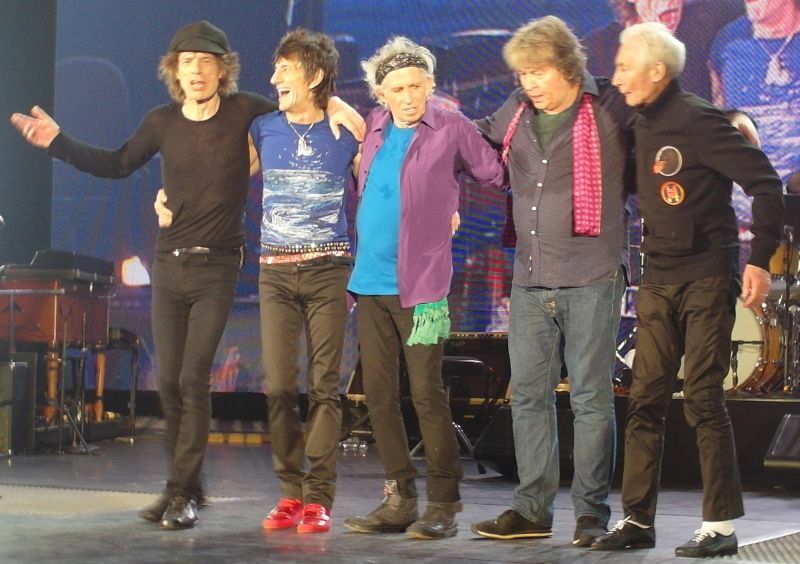 Plenty of smiles between all band members (yes, including Keith and Mick). In fact I think they were all have a good time. We certainly were and they knew it. The set list? Well I know that when you are sat at home, thousands of miles away, reading the set list, watching the odd video, we all search for the rare track we've never heard live before (except maybe outside the rehearsals). But actually in an intimate gig, when the audience and band are partying, it all feels very different. It was great fun, and a great set list for this gig. No complaints from me or anyone else I heard. Even the warhorses were excellent on the night. Slipping Away - really works well; some lovely MT licks during the verses - adding to "original"
Sympathy - Mick seemed to have no monitor working at the start and was a semi tone flat (very unusual); Bernard's backing, an adjusted earpiece, and a key note from Chuck during the solos fixed all that. But how Mick sang and danced with that Gorilla suit in a room of high humidity and rising temperatures I do not know - he must have lost a litre of fluid during that number alone. He was running until the end of the show in fact. Goodbyes - they all looked totally knackered by the end - over 2 hours of pure energy and fun; rising heat and humidity in the venue; the intimacy with the crowd. Afterwards people streamed away with smiles on their faces. Mick had mentioned their first Singapore gig in 1965 (at the badminton club); I can't help feeling this will be the last time around Asia - and the band and the crowd knew that. Looking across the bay towards the skyscrapers of Singapore's CBD I couldn't help thinking that in 1965 none of those buildings over 10 stories high existed (ie the whole area), and the flight from London must have involved one or more re-fuelling stops. The band, like us all, show the external signs of those 50 years - until they start to play, and then it's like a time warp of the best kind. I am lucky enough to be in Auckland for the final gig of this run - can't wait! Two years ago my son Nikita, then 17, was attacked in Brussels and ended up the next day in an emergency room with a traumatic brain injury so intense that most doctors were thinking he would be totally paralyzed for the rest of his life. Same trauma as Keith Richards a few years ago and Michael Schumacher earlier this year. That day in the emergency room, I promised to him that we would go again to Rolling Stones gigs and he should not worry, everything would be fine. 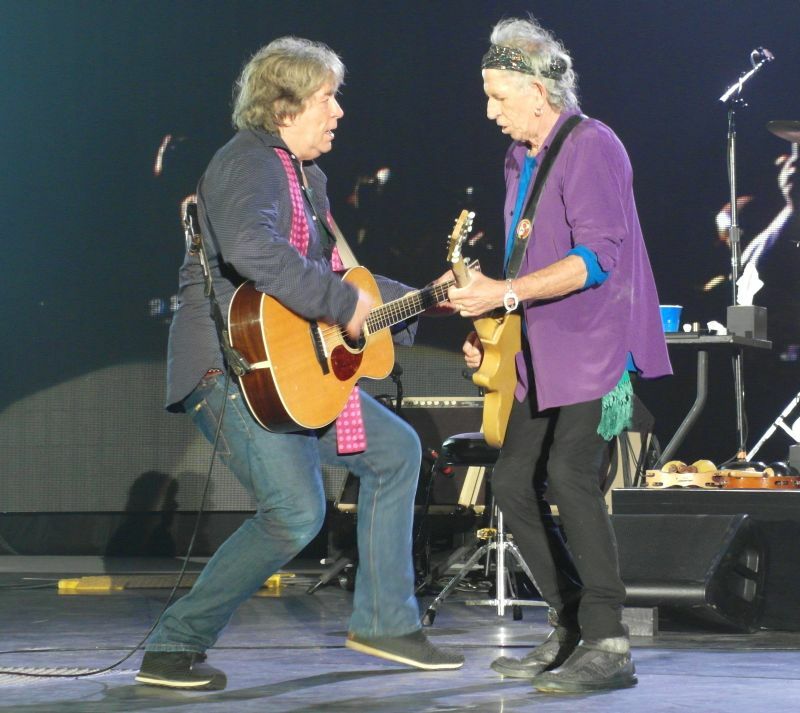 We had been to quite a few Stones concert already in Belgium, LA, Dublin, Amsterdam, Paris etc... and usually writing reviews together in IORR. Long story short, the long awaited gig was Singapore yesterday. Both of us were together again at a Stones concert. It is really hard for me to express the feeling. What a fantastic night it was. And a good choice it was with only 5000 people and an even more "Club show feeling" than Macau. Singapore is the smallest venue of the Asian tour, smallest number of people but it seems all of us were decided to balance numbers by a sky rocketing enthusiasm!!! The audience was on fire. Mick even came back to his "Brussels Affair" time by throwing water on the first rows. Keith was in absolutely superb mood, leading the game most of the time with impeccable riffs, right on time, not too much, Keith at his best. Last word to Nikita: "They are playing better than before". 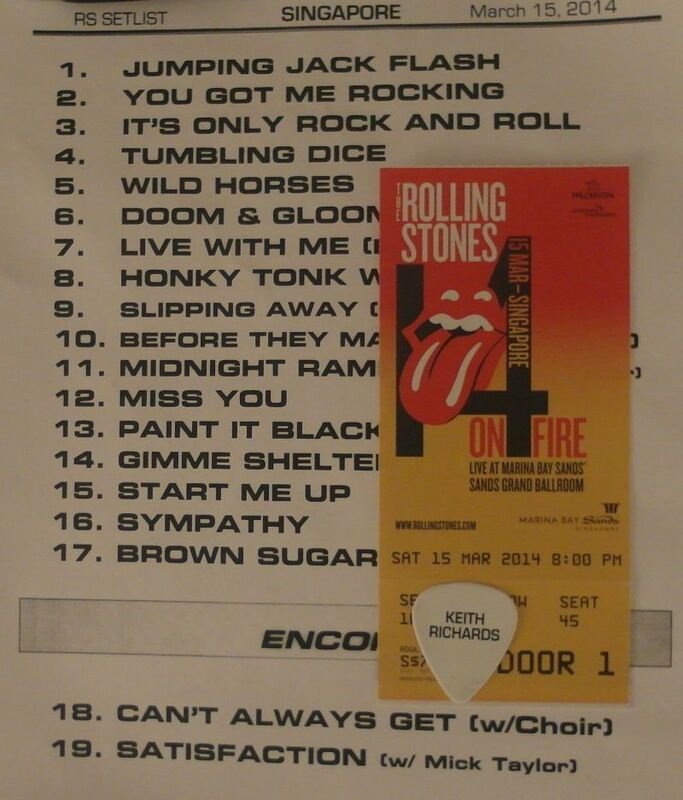 Thank you Stones, see you in Adelaide. Gricha and Nikita. It is hard for me this time to separate the show from just the whole experience I had in Singapore. The Sistec company handling the tickets should just be flogged. That said, from sources, at last minute, I ended up with two tickets, not one , and the best was from a fan who read my posts on IORR. The show itself was just amazing. I was at the two O2 shows and the two Hyde Parks, the beginning and end of the 50 and Counting tour.At those shows I was impressed with a seasoned professional show by performers that had something to prove. They proved it. Even though it is basically the same show, last night was different. BV has said that the show was a little off after Macau and Shanghai. I cannot see how, last night I saw a living working rock band. Mick actually went out into the audience! Their was a different vocal arrangement on SFTD that worked and was somehow more ominous for its difference. MR had all the expected flourishes by MT, but then near the end Ron steps up and for every not of vibrato drenched blues solo that MT had offered, Ron played a raunchy powerful rock solo that shows he takes a back seat to no one. 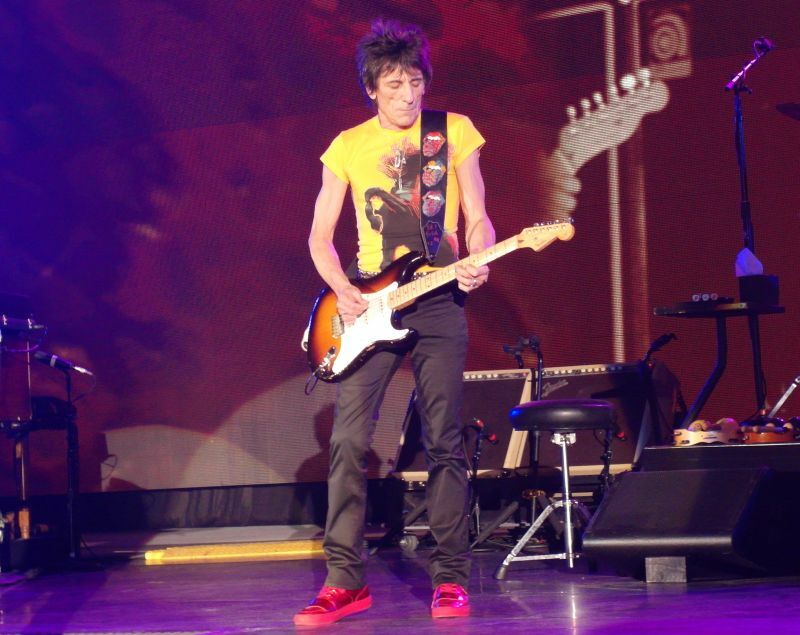 If anyone deserves to play guitar with Keith Richards, it is he. In fact , Ron was everywhere last night when he needed to be . Mick several times could be overheard, microphone down, commenting in how hot the band and the night were.They were in the zone, and they knew it! I am jaded. I was ready to be entertained. 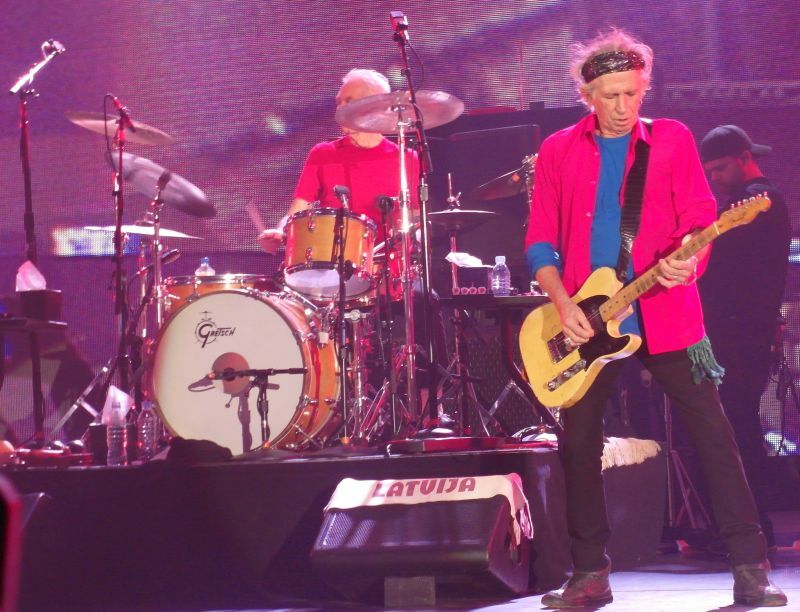 I have seen enough shows during the years that often I find myself at shows thinking its as much a habit as anything else; the Stones tour, I follow, hooking up with Beast, Manofwealthandtaste, Paulywauly, and all the other regulars. Not so last night. Last night I saw a band that seemed more alive and on fire ( trite I know by tour name, but true) than I have seen in years. The regulars were there, many of them But It does not matter, I saw the Stones. I am off for Perth. Said to be 8000 people capacity which is a very small for the greatest rock'n'roll band in the world. Unlike other venues easy to approach easy to buy souvenir and very comfortable seats. 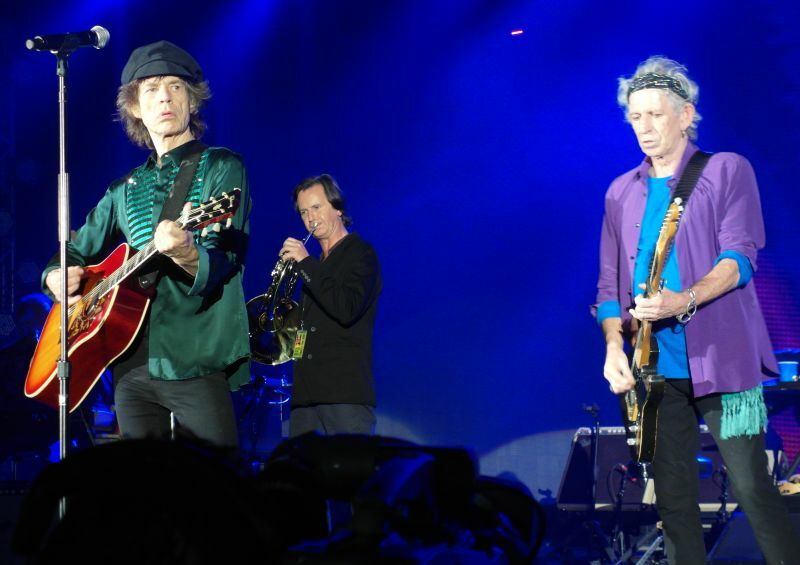 Compared to arena dates this was truly a happy Stones family gathering with very intimate atmosphere. So it was just so good to be there from JJF solid start till just awesome Satisfaction!! I think there will be no such small party with this greatest band of all time. So thank god we were just luckiest persons in the world for a moment. And I believe they will be back. Just keep on rock in'! !